I was about 10 years old when Granny taught me the secret to her fried chicken. Again, nothing fancy – but maybe a little unique. 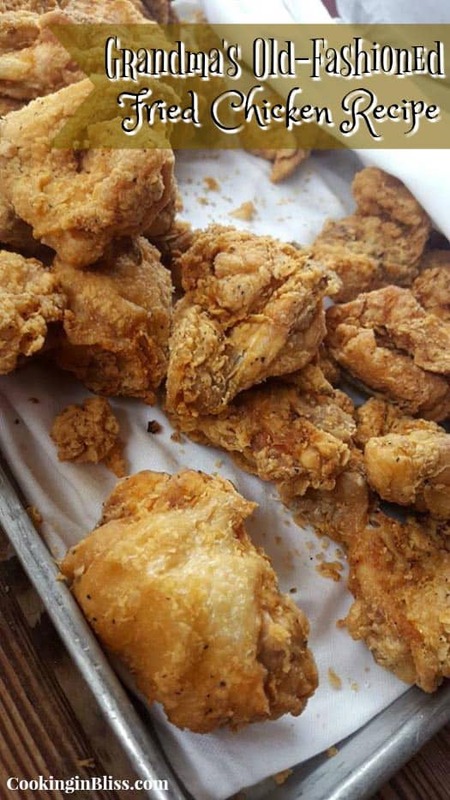 Granny’s secret fried chicken recipe used pancake flour. Aunt Jemima’s pancake flour to be exact. I should have guessed that since she had a humongous collection of Aunt Jemima figurines. She collected them for years and got a pretty penny when she decided to start collecting light houses instead. Looking back it was a little strange that she always had pancake mix in the pantry. She always made her pancakes from scratch; now I know why she had it. But wait, there’s more to the secret! See, Granny didn’t stop at pancake batter to make her fried chicken the best. Her other secret was in the brine. She used a salt/water/honey brine for her chicken. It always came out perfectly tender and juicy. She let the chicken sit in the brine (covered in the refrigerator) for 3 ½ hours exactly. Simmer (don’t let it boil) the mixture on medium heat until the salt has dissolved, then let it cool. Pour it over the chicken (in a plastic or glass container) and refrigerate covered for 3½ hours. Each time I make this chicken it comes out amazing, but can’t get it quite perfect. It comes close – but there’s always something missing. Either the salt or the juiciness is always a little off. It may be because everyone likes their chicken cooked different here. John likes his almost burnt, Dameon wants his barely brown and I like mine right in the middle. Talk about a lot of work, haha. But the end result is totally worth it. 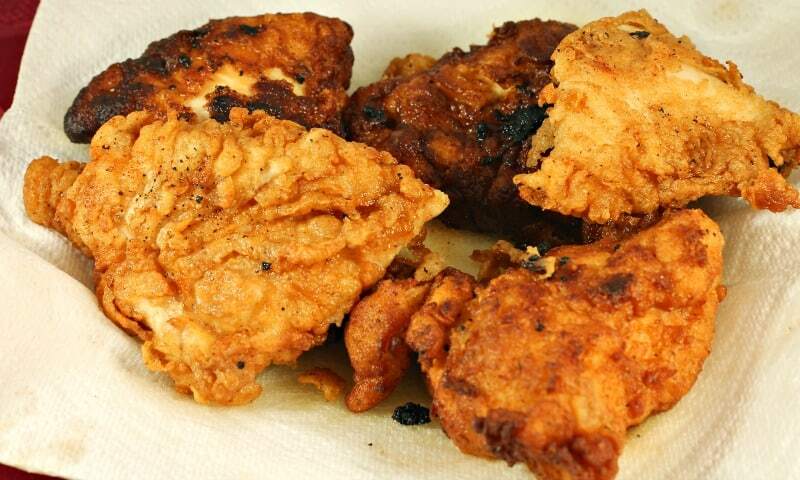 Tender and juicy fried chicken with Granny’s secret twists. Mix pancake flour, salt and pepper in a large bowl. In a separate bowl combine egg, butter & milk. Remove the chicken from the brine and rinse. Pat dry. Dip chicken pieces in the egg mixture and then dredge in the pancake mixture. Shake off any excess. Fry 3 – 4 pieces of chicken for 7 – 8 minutes (or until desired color is reached) and flip. Repeat with remaining chicken. Have you ever had fried chicken made with pancake flour? This looks so good. I haven’t had fried chicken in such a long time! I rarely eat it myself, but everyone else loves it so I make it for them. It is, the crispy part is the best part! Of course the meat itself is wonderful – Granny knows what she’s doing. As long as chicken is drained on a paper towel after coming out of the pan it shouldn’t be greasy at all. I use this recipe and always add a touch of chipotle powder to the brine (1/2) teaspoon and my guests just can’t get enough. They love the tiniest touch of spicy chiplotle flavor. People pay me to make it for their big events and occasions. I made over $11,000 last winter making this recipe. I guess that’s what they call Chicken Scratch – HA! Of course, I make a huge batch of buttermilk waffles and honey to go along with each serving of my giant boneless chicken breast. The chicken will stay crispier if it is placed on a wire rack instead of a paper towel. Always drain on a wire rack not paper towels. Makes a huge difference. What kind of pan and oil is used? Amazing. I would have never guessed pancake mix. I believe I will be trying your granny’s recipe. Thank you for sharing! This looks sooo good! I love fried chicken, but never make it! Maybe next week? That chicken looks really delicious!!! I haven’t friend chicken in forever, and I need to, it’s so good. Thanks for sharing a family secret. I never thought of using pancake flour for fried chicken. It really is brilliant already containing the baking soda and sugar. Thank you for the recipe I can’t wait to implement it in my kitchen. Amber, this looks amazing!!! I love fried chicken and seriously what a secret ingredient! Pinned it, I have a whole chicken in the freezer right now, just need to pick up some pancake flour! Thanks, Isra! Granny is a true southern cook – she has lots of twists in her recipes that make them really stand out. It’s definitely comfort food – so yummy! This looks so delicious! In fact, just about everything you’ve posted looks amazing! Going to be pinning a lot from you!! 🙂 I’m still working on my photography – but I’m getting there! I’m so glad you’re enjoying my posts. OMG I need some right now…with a bunch of mac and cheese and mashed potatoes! YUM! Does the pancake mix have sugar in it? It seems like the honey plus that would make the chicken taste sweet. Hmm. Sure looks good though! I think it has a little bit of sugar, not overly sweet. I think the tinge of sweetness is what sets her chicken apart from the rest. What about cooking temp? Medium or medium high? Sounds wonderful! Medium! Medium high may work but I keep mine at a medium setting. Sounds great. I’ve pinned it so I can remember where to find it. Thanks! I have wondered how to make the perfect fried chicken. Book marking the recipe so I can give it a try. I love home fried chicken. This is a great recipe. I love it. We have a link party called Wednesdays Adorned From Above Blog Hop and would love to have you share this and any other posts with everyone. It runs from Tuesday night through midnight Sunday. Here is the link to the party. I completely agree with your granny that brining is absolutely essential to good fried chicken. I’ve never tried breading it with Aunt Jemima before. Clever! If you haven’t already, I’d love if you’d come join my How To Tuesday link party, too. I was born, raised and live in the south. Fried chicken is a natural for a true southener. I have tried it many ways and so far I have liked mine the best and evidently so did quite a few others. I used to have to fry, it seemed like loads of it for my ex-husband and his coworkers. He shared some at lunch one day, then it seemed like a constant request. I’ve Never Tried Pancake Batter, But I’ve Often Eyeballed The Cake Flour. I’ve Just Been Too Afraid To Try It. :/ Maybe I’m Way Off On That, But For Some Reason The Cake Flour Just Calls My Name When I Prepare To Fry Something. I never would have thought to use pancake mix to batter the chicken, but it seems like a perfect idea! 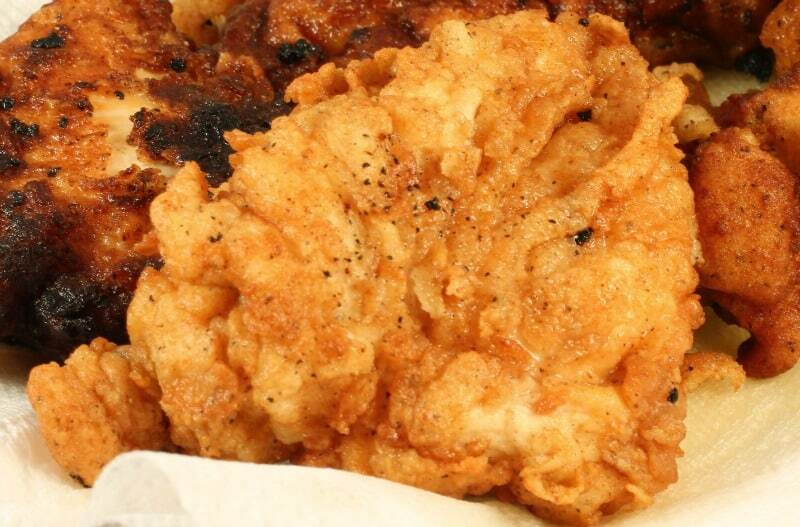 Amber, your Fried Chicken looks so good, and what a great idea for the batter. Thank you so much for sharing this special recipe with Full Plate Thursday and enjoy your weekend. Hi Amber, This recipe looks sooo delicious! I was wondering if you are deep frying the chicken? Are you just using a little oil in a fry pan or putting the whole pieces of chicken submerged in hot oil? ps. I love your blog! 😉 Invite to visit me @ [email protected]. When I began cooking 25 years ago, I used pancake batter to fry chicken. I almost always burned it a little, just like in the picture @the top of the page. One question: Is it regular pancake mix or the complete? Dying to try it! I’ve used both but prefer the regular pancake mix! I don’t really like fried chicken to greasy for me. How would I be able to do baked fried chicken with this recipe. Sounds about right! Love that my family isn’t the only ones who use Aunt Jemima mix, been using it for years. To me it gives the chicken that extra umph that all purpose flour doesn’t. I will be trying your recipe ASAP! When you say pancake flour. . Is it just plain flour, or is it complete pancake mix? ? It’s GREAT!! I discovered this recipe on my own about 3yrs ago…I was short of flour.so I used pancake mix for the second batch totally separate to TELL A DIFFERENCE AND Omg the pancake mix gives you such a perfect golden color with a nice crunch that gives you an AMAZING GOOD FRIED CHICKEN TASTE!! if you like fried chicken give pancake batter a try!!! Any brand I’ve tried several!!! Thanks for letting us in on the secret to perfect fried chicken! What kind of oil do you fry the chicken in and at what temp. This fried chicken is the best! I cant Thank you enough for sharing this recipe…we will make this for years to come. Why do you rinse the chicken after you have brined it? How much oil and what kind? Why does it have to be EXACTLY 3 1/2 hrs? The chicken looks delicious! I haven’t fried chicken since I lost my husband almost 5 years ago. I would like to try a different better. I do have a concern about the gravy, does it have a sweet flavor, and also is the batter thick after its fried. Thank you for Sharon Granny’s recipe.